Joyland Casino is no longer available . Click here for alternative casinos . Sure! Joyland Casino offers plenty of bonuses just for signing up and a large array of high-quality games. However, it does not measure up to its competitors in terms of customer service and overall convenience for users. Powered by Playtech software Joyland Casino offers over 100 games including slot machines, video poker, lottery games, scratch cards, live dealer, arcade games, as well as card and table games. In addition, Joyland Casino offers a large number of jackpot games. Sports fans can check out the Ice Hockey online slot and Knockout, a fixed odds boxing match with high quality 3D graphics. 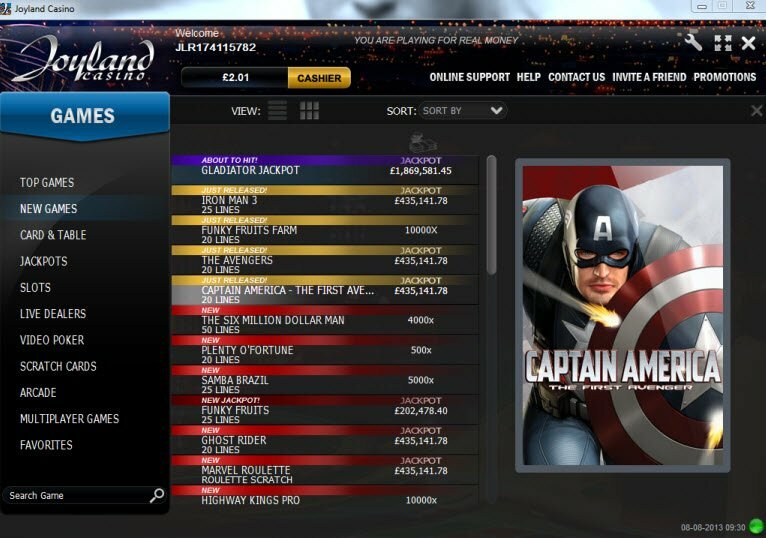 Joyland Casino offers a wide array of comic-inspired games including Captain America Scratch, Marvel Roulette, and the Incredible Hulk video slot with 50 paylines. Gamblers can also play Joyland Casino jackpot games for a change to strike it rich instantly. 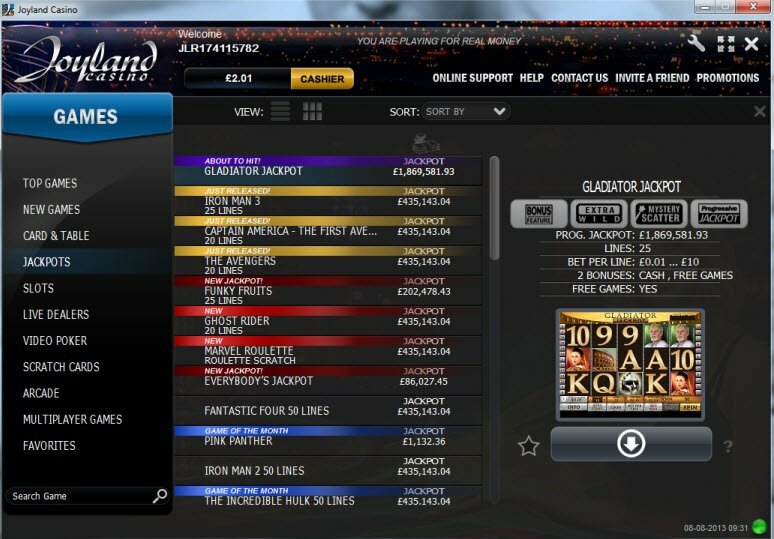 Unlike other casinos which come equipped with a number of ready-to-play online games, most Joyland Casino games do not come available with the basic software and require additional download. Unfortunately, Joyland Casino does not allow users to “play for fun” in order to test their games and requires playing with real money. Joyland Casino promotions offer a variety of different options depending on how much you’re willing to deposit up front. 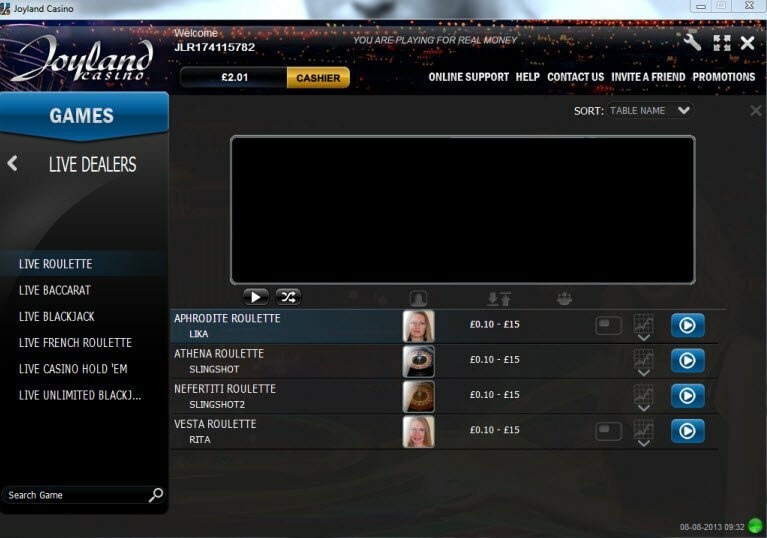 For example, they offer a 25$/25€/10£ signing bonus just for creating a joylandcasino.com account. The casino also rewards for each friend that members refer to sign up. Sports fans can check out the Ice Hockey online slot and Knockout, a fixed odds boxing match with high quality 3D graphics. Be sure check out Joyland Casino’s Special Deposit Method Bonus for members who use specific payment methods. Those who deposit with Moneybookers will receive an additional 25% bonus. Members get an extra 10%-15% Joyland Casino bonus when depositing with NETeller, Citadel, EcoCard, PaysafeCard, UseMyBank, Maestro/Switch Card, Solo Card, WebMoney or Wire Transfer. Joy Land Casino claims to offer 24/7 customer support available in Canada, the United Kingdom, and internationally via online chat, phone, or email. When I sought online support through the casino interface, a customer service representative finally responded after 10 minutes or longer. The person did respond to my inquiries, but took a very long time to do so. Overall, I didn’t find them very helpful. I think it is excellent that this casino offers welcome bonuses for particular payment methods. I wanted to begin depositing at Joyland with Moneybookers anyway! This was just that final nudge for me. And It was well worth it.